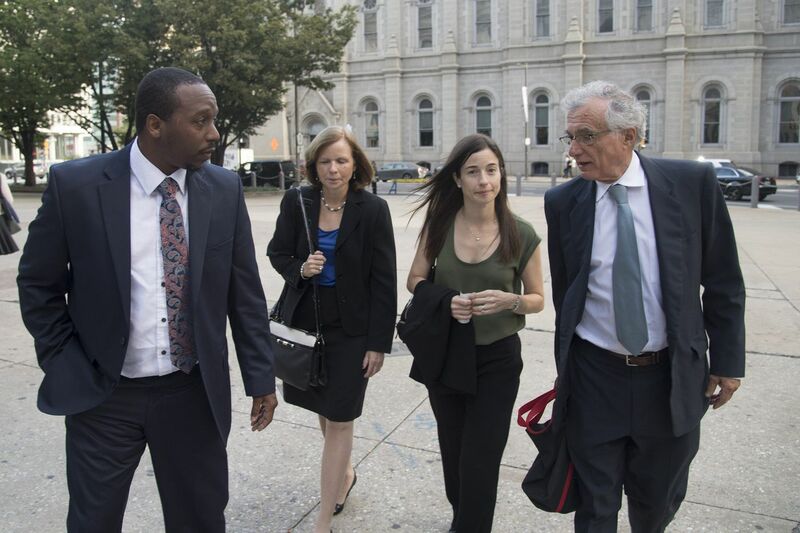 Plaintiff Bryant Miller (left) walks into Philadelphia City Hall September 13, 2016 with lawyers who would be arguing in front of the Pennsylvania Supreme Court for better school funding in Pennsylvania. The lawyers are Maura McInerney of the Education Law Center, Deborah Gordon Klehr, executive director of the Education Law Center, and Michael Churchill of the Public Interest Law Center. Not only has Pennsylvania's new school-funding formula failed to remedy disparities between wealthy and poor public school districts, the spending gap between such districts has grown, according to a filing Friday by plaintiffs in a landmark funding lawsuit. The formula also hasn't pumped money into cash-strapped schools. State money available for classroom costs has actually decreased since 2013, because pension expenses incurred by districts have risen faster than state aid, according to the filing by the Education Law Center and the Public Interest Law Center. They represent a group of parents, organizations, and school districts, including William Penn in Delaware County, that are challenging the constitutionality of Pennsylvania's education-funding system. The lawsuit, filed against the Pennsylvania Department of Education in 2014 and reinstated by the state Supreme Court last year, alleges the system discriminates against children based on where they live, since lower-wealth communities cannot keep up with rising costs. "Our client districts have some of the highest tax rates in the state and are struggling to provide the most basic resources," Michael Churchill, a lawyer with the Public Interest Law Center, said in a statement. "If the legislature continues to shortchange schools, a child's opportunities will continue to be determined by the accident of their zip code." Friday's filing comes in response to a motion to dismiss the case by State Senate President Pro Tempore Joe Scarnati (R., Jefferson), who argued that the lawsuit's claims were moot in light of a 2016 law that revised the way the state determines funding for each of its 500 districts. J.J. Abbott, spokesman for Gov. Wolf, said the governor "remains committed to achieving fair and adequate funding for education in Pennsylvania." He also said Wolf had increased the state's overall investment in K-12 education by $2 billion, helped districts bring down pension costs, and "passed and implemented a fair funding formula." While the formula directs additional aid to districts with high numbers of students living in poverty, it only affects new state education spending after the 2013-14 school year. Currently, the formula applies to less than 1.4 percent of total education spending, according to the filing. Pennsylvania for years has provided much less school funding than other states, meaning districts have had to rely heavily on property taxes to cover costs. In addition, the financial gap between what the state's wealthiest and poorest districts have to spend per pupil has grown in recent years, according to the filing. In 2012-13, the typical wealthy Pennsylvania school district had about $3,058 more per student than a typical poor district, according to Mark Price, a labor economist at the liberal Keystone Research Center. By 2016-17, that gap was $3,778, according to Price. In Philadelphia, for instance, the School District spent $9,062 per student in 2016-17, excluding construction costs. The typical wealthy district, meanwhile, spent $15,748, according to Price's analysis, which looked at the 100 wealthiest districts and used enrollment figures that accounted for differing levels of need among students. The analysis also highlights taxing differences between school districts. In 2016-17, the plaintiff school districts spent less but taxed at higher rates than the state's wealthiest districts. Pennsylvania's spending gap between rich and poor school districts ranked as the nation's worst in 2015, according to federal officials. Legislative leaders have until Aug. 5 to reply to the filing.